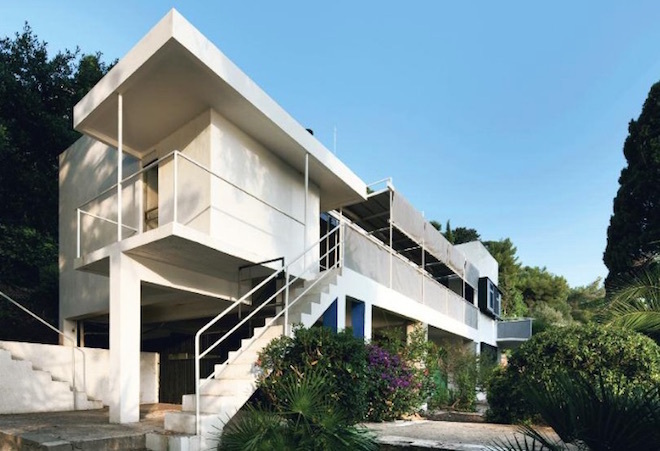 Nearly a century since its completion, Eileen Gray‘s peerless E.1027 villa seems in motion while at rest. With a daring streamlined shape akin to a ship’s prow, the home seemingly slices into the Atlantic waters off Roquebrune-Cap-Martin, France, from its perch on the coast. It also continues to point forward. The most famous shot of Eileen Gray, taken in the 1930s. Courtesy Aram. A thoroughly modern woman created this paragon of modern design. Born into an aristocratic Irish family in 1878, Gray defied Victorian expectations by moving to Paris in 1907. She ran with a fast crowd, one which exemplified the kinetic energy of the French capital in the 1920s and ’30s, all while running her own design studio doing high-end furniture and lacquer work, an art form she learned from a Japanese master. Gray drove an ambulance during World War I, went ballooning with Charles Rolls of Rolls-Royce, and dated whom she wanted, included nightclub singer Marie Louise “Damia” Damien. (The pair could be spotted driving through Paris in Gray’s roadster with Damia’s pet panther sitting in the back). But she sadly became the protagonist in two age-old stories—a lover scorned, and a woman’s talent overshadowed by male peers—making the story of E.1027 about much more than just an aesthetic accomplishment. The Blue Marine Rug Eileen Gray designed for E.1027. Courtesy Aram. From 1926-29 Gray designed the house as a vacation getaway for her then-lover, Romanian architect and critic Jean Badovici (the letters and numbers in the name are code for their names). Their relationship did not end well, and after they broke up in 1932, Gray moved out. Badovici, for his part, remained friends with mutual acquaintance Le Corbusier, who not only staked territory right next door for his own Petit Cabanon, but who would later deface her creation with his own artwork. Curbed spoke with more than a half-dozen scholars, artists, and preservationists who were involved in either the long-awaited restoration of E.1027 or related projects that chronicle Gray’s life and career to get a better sense of what it took to reopen this legendary building, and how questions and controversy remain to this day. Eileen Gray’s Paris bedroom, from the original Domus article from 1968. Gray’s career as an architect and designer suffered after World War II. The highly regarded furniture maker, lacquer artist, architect, and designer wasn’t part of an established community of modern architects, and she only received a handful of private commissions after E.1027. She spent most of her remaining years until her death in 1976 living in her flat on Rue Bonaparte in Paris working on furniture projects. Beginning in the late 1960s, a slow trickle of articles and gallery shows brought her back into the public eye. A partnership with London design impresario Zeev Aram to remake and reissue some of her designs resulted in a license for classics like her adjustable chrome side table, originally made for E.1027. Gray’s Bibendum Chair was based on the shape of the Michelin Man. In case Gray is considered too serious, remember Bibendum comes from the phrase “Nunc est bibendum,” or “Now is the time to drink.” Courtesy Aram Designs. Behind the scenes photo during the Price of Desire shoot, recreating the late ’40s at the home. Copyright Julian Lennon 2014. After Gray moved out in the mid-1930s, Badovici used the home for its intended purpose of entertaining. According to Goff, “Some of the most important ideas in modernism were born from evenings of drinking and partying in that house. It was a melting pot.” Perhaps the most consequential invitation Badovici ever extended was allowing Le Corbusier to paint a series of eight salacious, Cubist-style murals on the interior in 1938 and 1939. Obsessed with the design of the house, Le Corbusier was supposedly jealous that Gray could create such a masterful work of art, according to many scholars. His murals incensed Gray, who felt it spoiled her building. Despite the twists and turns that befell the home over the next few decades—Nazi soldiers shot at it for target practice, Le Corbusier briefly lived there (and eventually drowned in front of it while swimming in the ocean), a former owner was murdered on the property—it was ultimately Le Corbusier’s murals that spurred the French government into buying the property in 2000. E.1027, Cabanon and l’Étoile de Mer. Courtesy Cap Moderne. Corbu, shirtless and relaxing inside E.1027. Photo via the Charnel House. In a 1929 issue of L’Architecture Vivante, Jean Badovici’s magazine, he and Gray wrote a dialogue discussing the home’s design. Tours and visits to E.1027 can now be arranged through Cap Moderne.